Dreamworld, in Coomera, Queensland offers many attractions to its guests who want to make the most out of their visit in the large theme park. Illuminate – if you love lights and lasers, then you love this attraction in Dreamworld. Illuminate is a special night entertainment which features state of the art pyrotechniques and spectacular movement of laser lights dancing with the beat of lively music. The Dreamworld entrance is transformed with laser projections and dancing lights. AVPX – Alien vs. Predator – this is the best spot to go to for guests who love to play like agents on a mission. In this attraction guests will join the battle against the alien creatures in a specially designed simulation environment to give the exact feel of the battle field against the enemies. Guests will be assigned in groups and they need to stay alert and fast in order to survive the game. It is a great, fun game for groups. There are many more attractions: Screamworld, V8 Supercars and more. And on top of these, Dreamworld offers many thrill rides, family rides, kids rides and wildlife viewing also. Dreamworld is a large theme park that can keep you entertained for days. A 1 day pass to Dreamworld is $79. A pass good for 21 calendar days to both Dream World and Whitewater World is just $99. Tamborine Rainforest Discovery Walk is a great place to visit if you want to experience the beautiful nature of Australia. This property is 30 acres surrounded with panoramic views and wide selection of Australia’s fauna and flora. The nature adventure starts from the Rainforest Eco Gallery. From the gallery, visitors begin to trek the elevated 300 meter walkway in the middle of the magnificent rainforest. The bridge is designed with heavy duty steel to ensure the safety of guests wandering the rainforest. It is designed to cater even to guests on wheelchair. The walkway starts with elevated area and progressively descends throughout the journey. Some interesting spots along the trek includes rock pools, waterfalls, and butterfly observation. The highlight of the Rainforest Walk is the area called Cantilever. It is situated 30 meters over a valley which offer breathtaking views of Australia’s rainforest and creek on a bird’s eye view. This is a 40 meter walk and ends once the guests reach The Centre. It takes approximately one hour to complete the trail. The Center is the pit stop for guests who completed the skywalk. This is a modern structure with café to offer guests with refreshments after a long walk. Guests can buy a token from souvenir shops and other merchandise shops inside The Centre. Whitewater World is the newest water theme park in Austalia’s Gold Coast (it opened in 2006). Located in Coomera, Gold Coast, Queensland Australia, the water theme park features extreme waterslides for adrenaline seeking individuals and is a family oriented place to relax and have fun. The massive Green Room may be the iconic ride in Whitewater World. Guests hop into a cloverleaf shaped tube which can seat up to 4 persons. The cloverleaf tube accelerates as it navigates through the 75 meter long tunnel and a special 15 meter funnel just before dropping out, literally. Riders are literally thrown in an upper hemisphere and rotate back to back in vertical banks just before the splashdown. Treat yourself to a day of fun in the water at Whitewater World. The park is adjacent (and some rides even overlap) with Dreamworld. Located next to the south coast of Queensland, Australia, Fraser Island is approximately 200 km north of Brisbane. Named after the shipwreck survivor Eliza Fraser, it was added as World Heritage site in 1992. 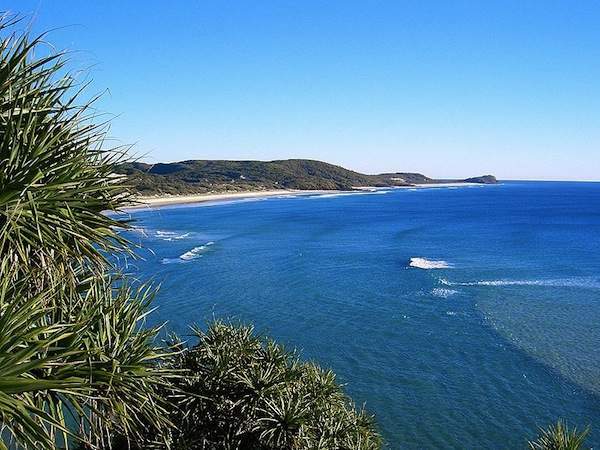 At present, Fraser Island is becoming a popular destination for tourists and is attracting more people to reside in the island. Fraser Island from the Indian Head by <a href='http://commons.wikimedia.org/wiki/File:Fraser_Island_a03_indian_head.jpg'>Sensenmann</a>. Geographically speaking, Fraser Island is estranged from the mainland. The northernmost area of the island is called the Sandy Cape where a lighthouse named after the place as operational since 1870 until 1994. Sandy Cape Light was the first operational lighthouse for European permanent settlement. There are more than 100 freshwater lakes found in the island. The well known lake is called Lake McKenzie which is situated in a small town called Eurong. The lake, perches right on top of compact sand, is 100 meter above sea level and is a favorite tourist destination. Fraser Island is rich with various species. Dingoes, for one, were once very common in the island but are now instinct. Known to be one of the largest sand island in the world and is considered a World Heritage, Fraser island also houses the biggest rainforest growing in sand. With the biodiversity, tourists will reconnect to nature once they visit the island. Also, roam around the island to visit historical places that have been situated there for a long time since European settlement. 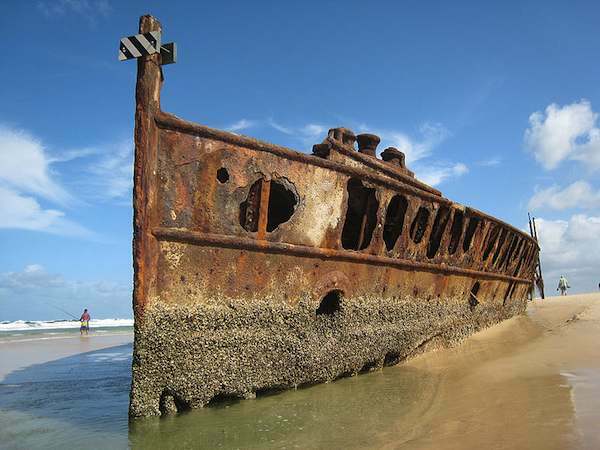 The wreck of the S.S. Maheno on Fraser Island, Queensland, Australia by Chavy. Whale Watching at Hervey Bay – Considered as the Whale watching capital of Australia, Hervey Bay is the ideal place to admire the natural beauty of humpback whales swimming carelessly in the crystal clear water of the bay. Hervey Bay also offers an easy jump off point from Fraser Island to other nearby islands. With its own domestic airport, Hervey Bay is a perfect getaway for all nature lovers out there. Travel Back in Time in Maryborough – This is one of the oldest city of Queensland where its history is told through the museums, houses and stores. Explore nature – Nature lovers will definitely discover untouched wonders of Fraser Island. Be amazed with the colorful sand dunes, freshwater lakes, crystal clear water of creeks, and vast wildlife animals. Gold Coast provides access to many other vacation activities for the whole family including: Underwater World and Dream World: both of which offer more excitement. The Great Barrier Reef is the world’s largest reef system composed of over 2,900 individual reefs and 900 islands stretching over an area of 344,000 square kilometres. The reef is located in the Coral Sea, off the coast of Queensland in north-east Australia. Approximately two million people visit the Great Barrier Reef each year. The Great Barrier Reef is the world’s biggest single structure made by living organisms. This reef structure is composed of and built by billions of coral polyps. This reef supports a wide diversity of life, and was selected as a World Heritage Site in 1981. The National Trust Queensland named it a state icon of Queensland. A large part of the reef is protected by the Great Barrier Reef Marine Park, which helps to limit the impact of human use, such as fishing and tourism. Other environmental pressures on the reef and its ecosystem include runoff, climate change accompanied by mass coral bleaching, and cyclic population outbreaks of the crown-of-thorns starfish. The crown-of-thorns starfish (see photo below)) preys on coral polyps. Large outbreaks of these starfish can devastate reefs. In 2000, an outbreak contributed to a loss of 66% of live coral cover on sampled reefs in a study by the RRC (Reefs Research Centre.) Outbreaks are believed to occur in natural cycles, worsened by poor water quality and overfishing of the starfish’s predators. The Great Barrier Reef hosts 30 species of whales, dolphins, and porpoises, including the dwarf minke whale, Indo-Pacific humpback dolphin, and the humpback whale. Large populations of dugongs live there. Read more about the Great Barrier Reef. 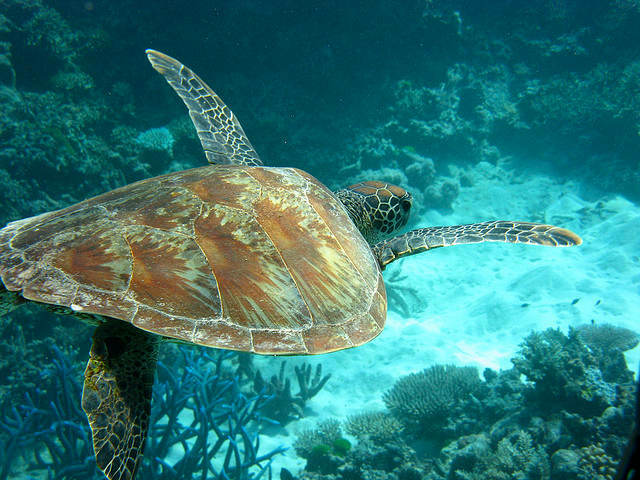 Photo of the Sea Turtle, Great Barrier Reef, Australia by Sam Harris. When planing your visit consider taking some time to visit the Daintree Rainforest, which is the oldest rainforest in the world.